This reference architecture is a predefined and optimized hardware infrastructure for MapR 5.2 Converged Data Platform, which is a Big Data solution with capabilities that are produced by MapR Technologies. The reference architecture provides a predefined hardware configuration for implementing MapR 5.2 Converged Data Platform on Lenovo System x hardware and networking products. Withdrawn: This reference architecture is now withdrawn. 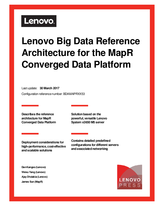 The replacement is Lenovo Big Data Validated Design for MapR Converged Data Platform.